pampas2palms: Does it have the WOW factor? 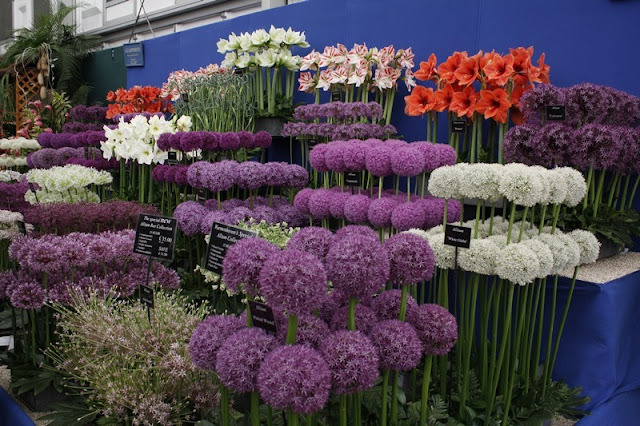 When I was judging Chelsea a few weeks ago, our judging team were in general agreement that some exhibitors needed to move into the 21st century and display their plants and flowers in a much more creative way. You may recall that Warmenhoven with its ceiling of Amaryllis achieved the Best in Show. This nursery have been repeatedly creative. Now last week at the BBC Gardener's World, I was also judging in the Floral Marquee but in a different judging team and found my negative comments on traditional staging were not shared by my fellow judges (to put it mildly!). Amongst our exhibits for judging, we had three stands of fuchsias and we had an experienced fuchsia grower amongst the panel of judges. 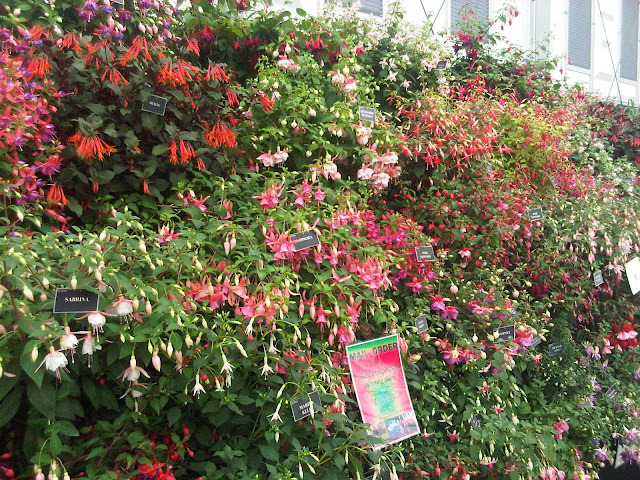 All three stands of fuchsias were similar, tiered displays (woops corrected my Freudian slip of 'tired') against a backdrop, with a wall of fuchsias from waist height up to about 2.5m (8ft). The following picture is not from that show, nor do I know what nursery this is, but it shows the style of exhibit precisely. I argued that it was not creative and did not show the character of any of the plants. One of the judges defended the display saying that there were some wonderful show standards at the top of the display. Well - if he'd have thought for moment, that point really emphasized my opinion, as the plants were so closely crushed together that it was impossible to see they were standards! Fuchsias can be grown and trained in several ways - bush plants, standards on a leg, pyramids and even fans - such wonderful adaptable plants! And then their habit of growth varies from the upright types, to the rounded, spreading and trailing types, beautifully displayed in hanging baskets. Add to all this, (and yes I have rattled on) the obvious fact that the fuchsia is a graceful plant with delicate flowers that should be displayed to display these characteristics. None of this was visible in any of the displays as all were just stuffed with plants. 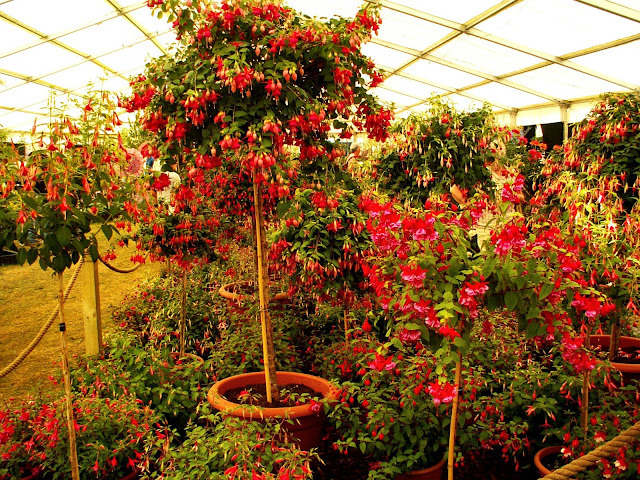 The following picture from the Royal Cornwall Show in 2006 shows that fuchsias can be exhibited in a more innovative way. 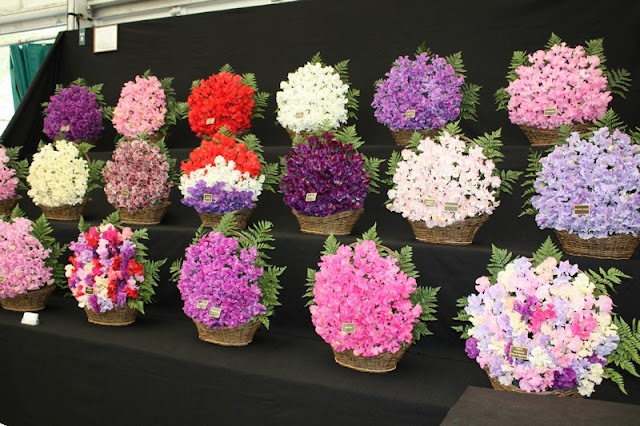 Now the fuchsia growers aren't the only ones with their heads in the horticultural sand and the following few pictures will give you an idea of the typical traditional display that is often repeated by growers at each show. In some cases it is so similar that in looking at my pictures, I can't really see the difference! The counter argument, often proffered by the growers is that this is what the public want - well is it? Would you like to see more innovation and different ways of display? I've never done a poll before, but if you have an opinion on this, let me know by casting you vote in the poll at the top of the right margin next to this post. Before you do that, have a look at a few more traditional 'show-stoppers'. And finally on a more positive and less controversial note, I did like Dibley's stand at the BBC Gardener's World Show. 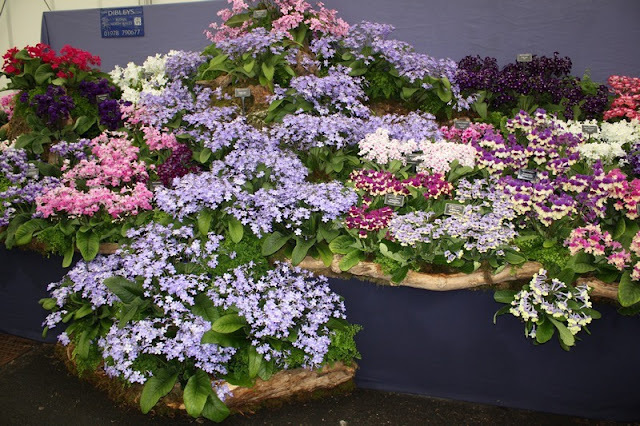 Although the presentation was fairly traditional, it was lifted by a cascade of pale blue Streptocarpus - possibly 'Falling Stars'. I like it! This whole style of display is so foreign to me, I just don't understand it! The more contemporary display really makes sense to me. The first image really does grab me, angular yet not. In planted gardens, I think this same thought has resonated with me with the need to move beyond Victorian / etc. cottage gardens...not no longer do them, but do so much more. Always innovate! A short note from a foreigner from the Czech Republic (sorry for my poor English): the style of arranging cut flowers in symmetrical way we use typically for cemetery arrangements; yes - the displays at pictures 4 and 5 recall me a mass grave.. I think you lack constancy here. If you ‘run with your argument’ then mass parks bedding and the ‘show gardens’ that are collections of mature plants crammed together in a way that would be impossible to grow must both be condemned as even more guilty of losing the individual plants. 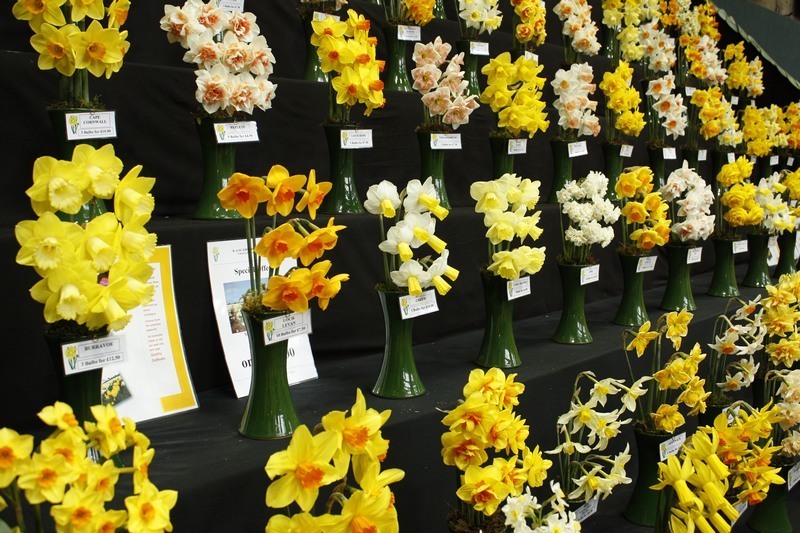 The RHS keeps saying that displays are now judged to the same criteria so that exhibitors know what standards to aim at. Are ‘innovation’ or ‘showing the whole plant’ amongst the criteria? If not it is unreasonable to expect exhibitors to ‘guess’ what the judges are looking for. I think there is another issue here too which the RHS has never dared to address: who are the displays for? If they exist for the exhibitors to show their wares, then they will know what their customers are hoping to see and that may not match the aesthetic of the RHS judges. The fuchsia displays maximise the number of varieties in bloom to advertise them and show great skill in the presentation of wonderfully grown plants but lack a ‘garden aesthetic’. If a stand is marked down for being wonderful and very similar to last year [which got a gold and this year the same display didn’t] then the standard is not consistent, the exhibitor doesn’t know what to do and if they stop exhibiting in case they can’t continue with a run of golds then the RHS and the visitors lose out as fewer stands are present each year. If ‘innovation of style of display’ is written into the standards then it can be judged; if not judging it is unfair and divisive. Some interesting arguments - could be quite a debate! There are many different ways of displaying mature plants, most of which would be valid in different settings. 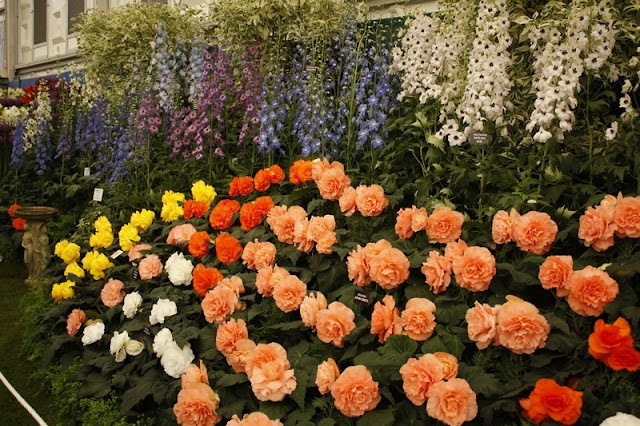 I for one have no objection to traditional Victorian style bedding, done well in the appropriate location but there are equally many other modern ways of utilising plants and the big flower shows are just the places where we expect to see inspiration and new ideas. It happens with the show gardens, so why should we not expect to see top notch nurserymen showing their plants in innovative ways? 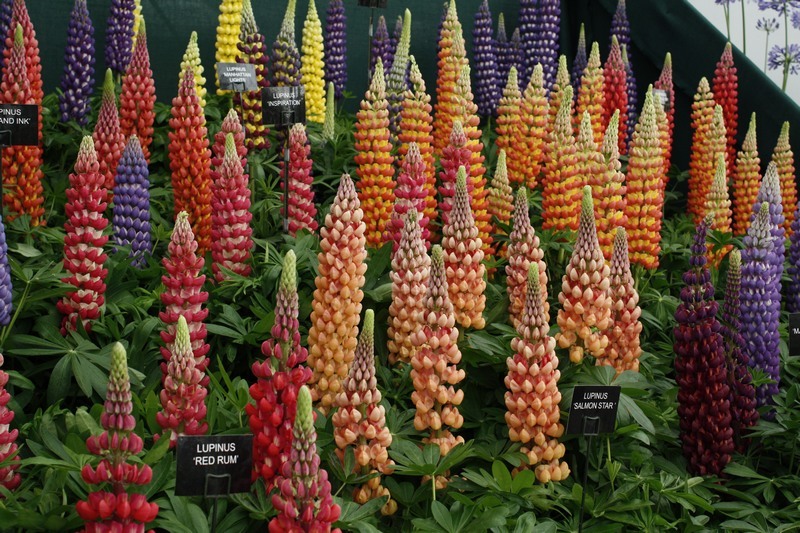 The shows are of course for the visitors but few of these would know exactly what they want to see, beyond good plants and some top quality horticultural theatre. It is for the RHS, the garden designers and the nurserymen to deliver that in all its variety. Judging criteria do include mention of design, creativity and innovation so yes its there. 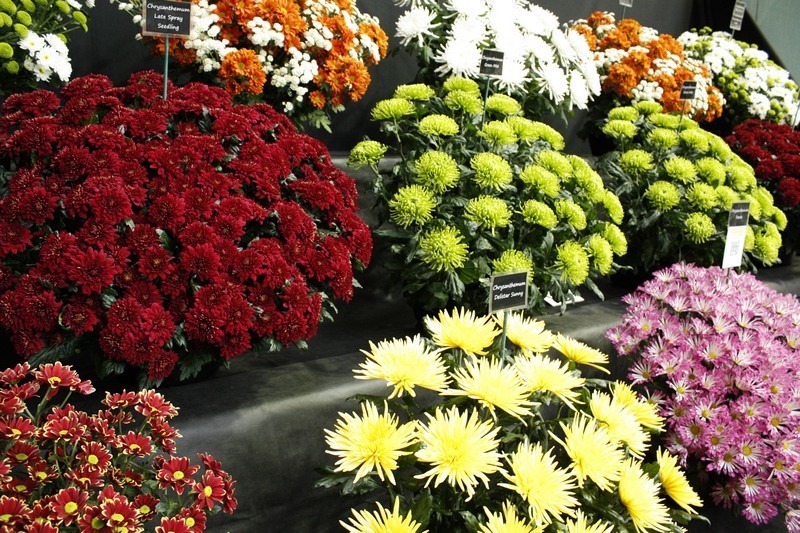 Plants must also display their main attributes, so if a flowering plant is exhibited and its not in flower then it's down-marked. Equally, to stuff sweet peas in a tight fan negates their delicate habit, as does cramming fuchsias tight together and so on. And besides we are talking of a living plant display not a plant catalogue! Exhibitors do not have to guess at what the judges want. Each exhibitor gets feedback from the judges about the merits and failings of their exhibit, so the opportunity is there to change and improve. Many nurseries do exhibit their plants in superb and creative ways, differing from show to show and the result is repeated high awards and good press. Its just a pity that a few seem stuck in the last century!